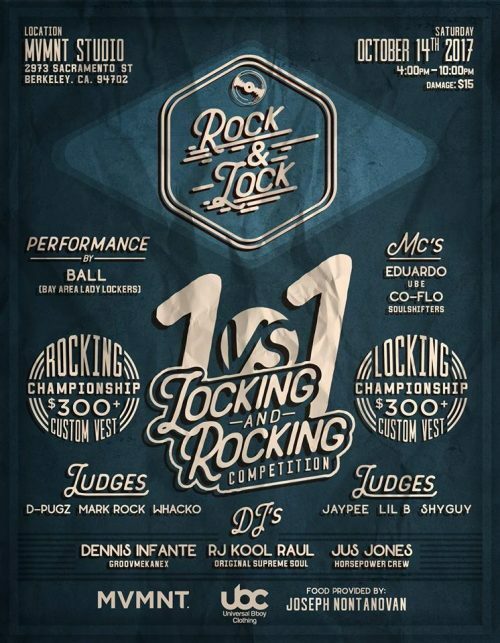 DJing for the first ever Rock & Lock Jam in the Bay! Pick up your Pre-Sale tickets at our GoFundMe! There are also T-shirts, Private Lessons, and other swag up for grabs. IN AN EFFORT TO PROMOTE AND EXPOSE THE ROCKDANCE AND LOCKING IN THE BAY AREA, LIL B & WHACKO HAVE JOINED FORCES TO BRING AN EVENT YOU DONT WANNA MISS. WE’RE CALLING ALL ROCKERS AND LOCKERS NEAR AND FAR TO COME TEST THEIR MIGHT IN COMPETITION. THIS WILL BE AN ALL AGES EVENT WITH SPECIAL PEFORMANCES, FOOD, GOOD MUSIC, AND FUN FOR ALL. THIS WILL BE ONE WEEK AFTER THE FINAL BAY AREA ROCKDANCE SERIES WORKSHOP AND WE ENCOURAGE THOSE ATTENDING TO ENTER. STAY TUNED FOR MORE UPDATES AS WE GET CLOSER TO THE EVENT. SEE YOU IN OCTOBER. SPECIAL ROUND- 17TH SPOT CAN CALL OUT ANYONE FROM TOP 16 FOR FINAL SPOT.